so at work... we find any excuse for treats i feel. for example, tomorrow is national bread day. so everyone is bringing bread to work... healthy right?? so i decided i would join the festivities and make some bread. I found this recipe off a blog, i find it quite nice. i like to make big muffins... i have this sweet big cup cake pan... use it all the time. funny thing about this pan... my sister did some sneak peaks with our wedding gifts, and so some of them didnt exactly have cards, so i opened this gift, and we tried to figure out who gave it to us... it was a mystery..
UNTIL like two days ago... my sister told me it was her friend will. thanks sister, just a lil late!! dont worry will, your thank you card is on its way!! here is the final product... i ate one of the muffins.. it was nice!! put in the oven at 350 for 40 minutes!! well i just finished the 2nd one... after i posted!! yum. I am totally stealing this recipe. 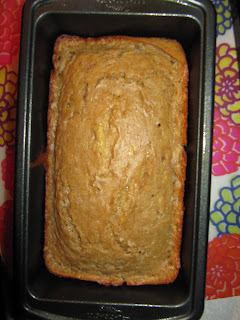 I have four way over-ripe bananas that I have been inspired to now bring over to your house. Make something for me?